A skilled, reliable crew keeps your customers satisfied and minimizes repairs and callbacks. By employing INSTALL certified flooring installers, you know you are getting the most highly trained field professionals in the market, taught by the best instructors in the industry. Using INSTALL certified labor ensures that a floor installation will be done efficiently, correctly and in a professional manner. In a competitive market, you know you need every edge you can get. With INSTALL certified professionals, you know your crew will stand out from your competition. By a conservative study, you are nine times more likely to have a flooring failure when you don’t work with INSTALL installers. Having certified installers on your staff can reduce or even eliminate installation problems and minimize claims. Mistakes can shatter the margin on any job. Delivering error-free installations not only keeps your customers coming back, it saves you time and money in repairs and back charges. Having INSTALL certified installers gives you a competitive edge. We have gotten the word out to specifiers about the value of INSTALL, and they are responding by including specification language in their bids that requires INSTALL training and certifications. So having INSTALL professionals on your staff qualifies you to win the best bids. When you work with INSTALL, our name recognition and strong reputation transfer to your business. Your alliance with INSTALL becomes an indication of your company’s dedication to quality and efficiency. Lead with it when you market your company and profit from our leadership in the industry. We encourage INSTALL contractors to discuss their alliance with INSTALL in marketing and sales materials, and use the INSTALL logo on marketing materials, uniforms, and other promotions. Our INSTALL Training Program is designed to teach fundamentals and keep floorcovering installers current with cutting-edge trends, technologies and techniques. Our instructors are the best in the business. 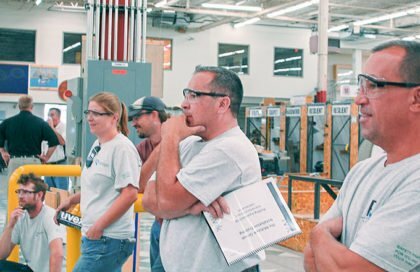 They are industry veterans that deliver a dynamic, classroom and hands-on training curriculum developed with input from manufacturers, contractors, and other industry professionals. Every hour that a union member works, money is contributed to our training fund. There are no additional costs to the installer or their employers. Your installers are more than just workers. They are the face of your company. A good installer reflects the value of their company, just as a poor installer can damage a contractor’s reputation with subpar work. Good installations lead to satisfied customers and repeat business. INSTALL prepares flooring pros to do great work and bring that repeat business to your firm. When you hire an INSTALL certified installer, you know they have proven themselves. To become certified, installers must show competency at each level before advancing to the next one, which makes a strong statement as to their integrity, ambition and self-motivation. To retain each INSTALL certification requires career-long training. Our comprehensive testing ensures that anyone completing our training program has proven their skills. The assessment process is rigorous and based on real-life conditions.